LATE JURASSIC MORRISON FORMATION Apatosaurus. 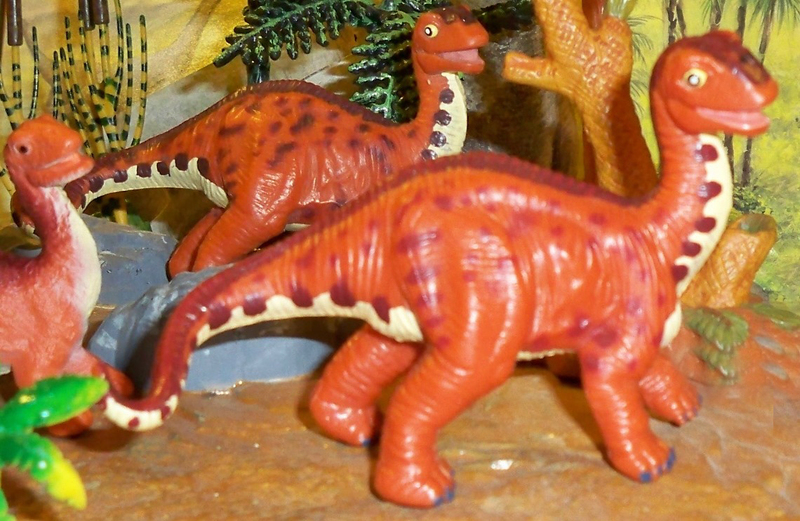 alt="A pair of Laramie Diplodocus. The middle scene contains a Kaiyodo Allosaurus and two bin stegosaur figures. 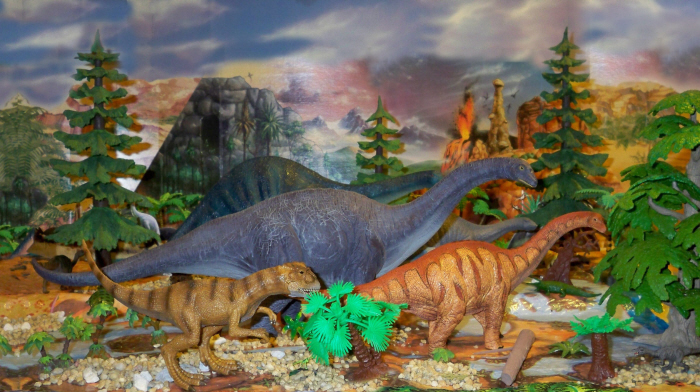 To the far right are two of the Diplodocus from the large bin figures JASMAN distributes. " title="A pair of Laramie Diplodocus. The middle scene contains a Kaiyodo Allosaurus and two bin stegosaur figures. To the far right are two of the Diplodocus from the large bin figures JASMAN distributes. " width="700" height="650"> Your browser does not support inline frames or is currently configured not to display inline frames. Apatosaurus was one of the most common dinosaurs in the Morrison. Complete skeletons, partial skeletons, skulls, hundreds of elements. It is a large and heavy animal with an estimated maxium length of 69 - 86 ft and weight of 25 tonnes. It is populalry know by it junior synonym Brontosaurus. Many early finds were named based on limted fossil material that later turned out to have already been named. The first name takes priority. Sauropod skulls are rare fossils and diplodocid skulls are particularly fragile. Since Brontosaurus was robust animal it seemed intutive that it would have a robust skull like the well documented Camarasaurus. Brontosaurus became famous thanks to the paintings of Zallinger and toys by Marx as an Apatosaurus body with a Camarasaurus head. Apatosaurus was a close relative of Diplodocus. It has been described as a fat Diplodocus. Apatosaurus was found widely throughout the Morrison. Typically found as individuals ranging from adults to adolecsents and younger. This has let to speculation that Apatosaurus was a full time resident of the Morrison living as an individual or in small groups. The large robust size would have enabled adults to protect themselves. The is some track evidence that has been interpeted to show juvinels sauropods traveled is age group and that in some cases of mixed age groups traved in the center. The shape of diplodocids has no analogy among modern animals. It must have been a very sucessful design since is remained unchanged for so many millions of years. The relaively aburpt decline of diplodocids at the end of the Jurassic argues it must have confered some specific environmental advantage. Apatosaurus was a ground-height nonselective browser. The long neck was either extended straight out in front or held at an angle with the head pointed downwards. One computer simualtion seemed to indicate the neck. Apatosaurus was diverse including several speices A. ajax, A. exelsus, A. louisae, A. yahnapin. The type speces is ajax. A. excelsus is an extremely robust version.The speices found lowest in the Morrision is yahnapin. It is considered primative enough to propose a redescription as Eobrontosaurus. The remaining species seemed to have coexisted.